As part of our our Love Worthy Farm, Leave No Trace campaign we are trying to raise awareness of the terrible state that Worthy Farm is left in when everyone goes home after the Festival. Abandoned camping equipment and rubbish blight the beautiful green pastures of the farm. It really is very sad. Please do your bit when you leave, take all your camping gear home and put all your rubbish in the bin bags provided by your campsite stewards. Even just five minutes of effort from each person at the Festival would make a HUGE difference. Thousands of tents and abandoned camping equipment like airbeds, roll mats, chairs, blankets and gazebos are left after each festival. 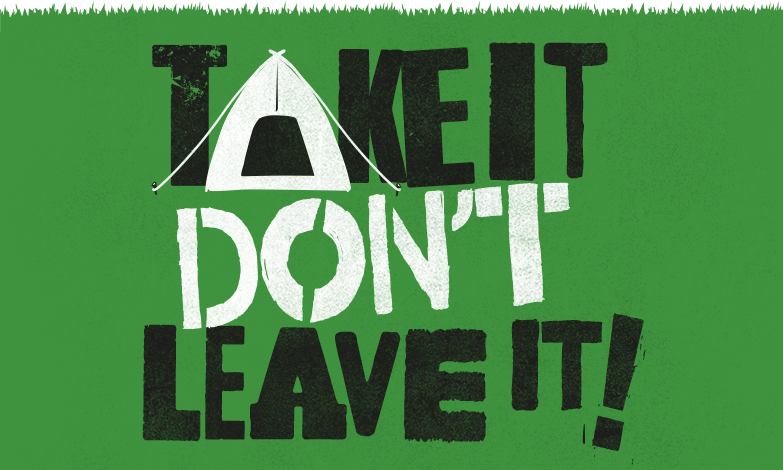 Think responsibly when you are packing your bags to come to Glastonbury, don’t bring items that you won’t be able to take back home again. Please remove all your tent pegs from the ground. It is really important not to leave any behind because they get imbedded in the ground and when the fields get rotavated, the metal pegs get chopped-up into small pieces, and if the cows eat them they could die. Remember that you have the energy to do multiple trips back to your car on the Wednesday when you are feeling fresh but come the Monday morning after 5 days of partying and having fun energy levels are very low. There are now 40,000 very well signposted and beautifully painted bins (colour-coded for recycled and other rubbish) virtually everywhere on site for your rubbish. As you enter the site, stewards will hand you a green bag for recyclables and a clear bag for general waste – please help us look after the land by correctly filling them up as you go!